Berkeley County Sales Tax Referendum – Where are we now? 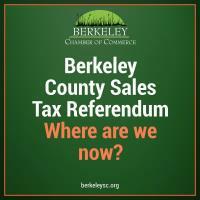 (Berkeley County, SC) – The Berkeley Chamber of Commerce has coordinated two successful referendums with Berkeley County residents approving a One-Cent Sales Tax. We are now approaching the end of the 2014 Referendum and there has been a great deal of discussion on our state infrastructure. With the projected future growth and the gas tax increase, we must stay proactive on what to expect for our infrastructure. The Berkeley Chamber will be hosting an update on the One-Cent Sales Tax roads and what this means for Berkeley County on Friday, March 29th at 9:00 a.m. at the Wingate by Wyndham at Charleston Southern University with special guest speaker, Mr. Frank Carson, Berkeley County Government Engineer. Seating is limited - registration is required for this event; and is available online at www.berkeleysc.org. Registration cost is $20.00 for Chamber members and $30.00 for non-members. Contact the Chamber for sponsorship opportunities or for more information at 843-761-8238/843-577-9549 or info@berkeleysc.org.